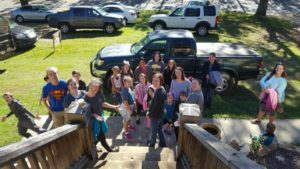 In mid October the sound of young voices and laughter filled the rooms at Grace Klein Community as energetic homeschoolers and sweet cheerleaders came together to serve. Mighty Oaks Homeschoolers volunteered their time to paint beautiful pictures and uplifting scriptures on food boxes. What a blessing for our food box recipients! A group served downstairs sorting fresh fruit for a church who then gave it out to people in their community The older kids organized two freezers and hauled heavy boxes of meat to another freezer and utilized their Tetris skills to make it all fit. Another team hit the Give and Take Room to sort and fold clothes. It was awesome to see all ages working together to serve Christ! From the tiniest helper to the biggest, each one made an impact. 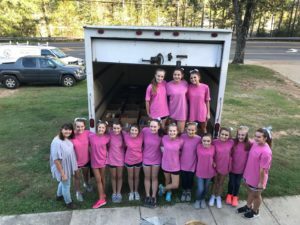 The following day, the Briarwood Basketball Cheerleaders showed up to serve in their matching pink shirts. They sorted and staged boxes upon boxes of canned goods for food delivery and counted chips and cookies for the upcoming homeless ministry. An awesome team taped and stacked close to 200 boxes in preparation for food delivery. Others weeded the garden, fed the chickens, and broke down boxes for the recycling bin. The smiles on the faces of both groups is a great reminder that serving not only encourages others, serving encourages us too. If your church, school, or business is interested in serving with Grace Klein Community, email amaris@gracekleincommunity.com for details. Serve days are a great way of getting involved in the community of Birmingham.